1. In a mixing bowl, whisk together all dressing ingredients until fully incorporated and smooth. (You can also blend everything in a blender until smooth). 2. Preheat a grill or grill pan over high heat. 3. Brush flat sides of avocado with oil, a squeeze of lemon juice and season generously with salt and pepper. 4. Place oiled sides of avocado down on grill or grill pan and sear for 3 to 4 minutes. 5. Remove avocados from heat and transfer to a plate. 6. 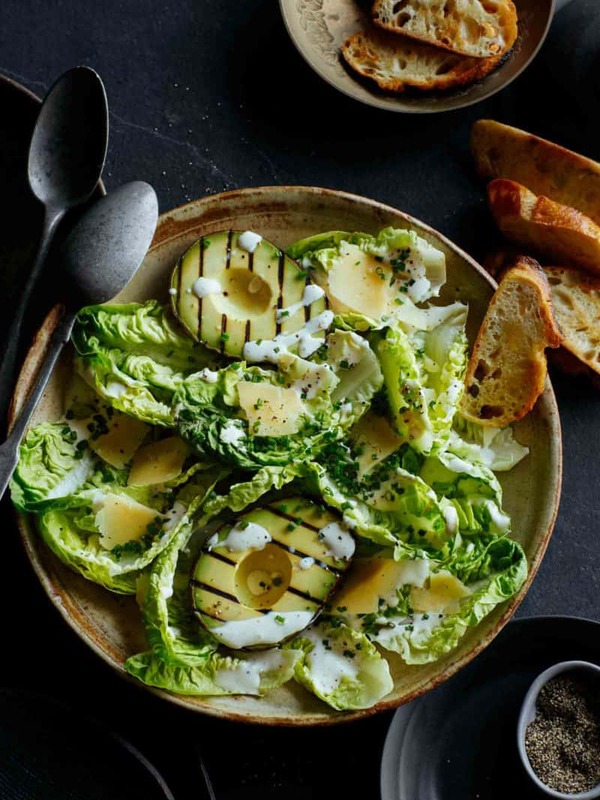 To assemble: Arrange lettuce leaves and avocado halves onto a large platter and drizzle with dressing. Season with salt and pepper and finish with lots of shaved Parmesan. Serve with side of crostini or grilled bread. I never knew avocado can be used like this too, thanks for the great recipe.